Using our Pro Bono Portal, you can view our online trainings, pro bono cases that need help, or update an existing pro bono case. Administrative and clerical volunteers are always much appreciated in all of our offices. Please contact your local office directly to find out more. Read our three year plan for involving pro bono attorneys with our work. We welcome comments or feed back on our plan. LAWV actively recruits, trains and supports attorneys who wish to share their expertise with our organization and clients. Our Pro Bono Portal offers attorneys online training, the opportunity to view cases that need help, and the ability to provide LAWV with updates on pro bono cases. 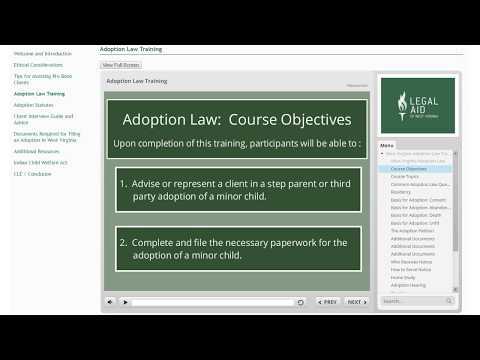 To learn more about the Pro Bono Portal, watch this video. Direct representation of clients pre-screened and referred to you through Legal Aid. We will work with you to identify clients in areas of law that interest you, and provide training, support and mentorship learning new areas of law. Commitments can be limited in scope - perhaps a single hearing for a domestic violence protective order - or more complex, depending on your needs. Additionally, all volunteer attorneys are covered by Legal Aid's malpractice insurance, and necessary litigation expenses are paid by the organization. Lead seminar-style clinics that help individuals representing themselves pro se on legal matters such as divorce or bankruptcy. Help them understand the legal issues they are facing, as well as walk them through the paperwork and forms they will need to file with the court. If you are a licensed attorney or paralegal interested in volunteering, let us know! LAWV has staff dedicated to finding meaningful opportunities for volunteer attorneys. Whether it's participating in an "Ask A Lawyer" event in your community, or answering telephone hotlines, there are many potential ways to help. Meet the 2017 Pro Bono Award winners! Are you an active status member of the West Virginia State Bar?